Here’s a first for me, text on a photo. I kind of love it, at least with this particular one. Maybe I’m just having a crazy day. I’ve honestly been avoiding it for ages. I promise it’s not necessarily a new thing, but I am curious: if you have an option of pinning or sharing an image that has text or doesn’t, do you prefer one over the other? Or is it more about the food and the actual shot of the food? So let’s talk about these cupcakes. I’d been saving carrot cake recipes for a while because the Mr put a request in for it, I don’t even know how long ago but definitely sometime in the last decade handful of months or so. I’d honestly, that I know of or remember, never had carrot cake prior to this week. Spice cake, sure! In fact, spice cake is one of my absolute favorite flavors. Light, fluffy and perfectly spiced. I was truly surprised at the similarities with these cupcakes and spice cake. Obviously there’s the giant difference of one having carrots and the other doesn’t. But hey, it’s close. I was kind of turned off by the idea of adding vegetables to something that was suppose to be sweet. Which btw means you’ll likely never see zucchini bread. I know bread isn’t typically sweet but veggies and sweets and bread just seems odd to me. At least in this case, it totally worked and wasn’t even obvious. In my search over the months, I saw some cake and cupcakes with seriously thick slices of carrot. I’m sure that’s partly my issue with carrot cake. It shouldn’t be noticeable. Blend it, not literally, in there. Finely shred and even chop further if necessary to make those shreds even smaller. No weird stringiness going on with the cupcakes – at all. So the cupcakes are amazing, super moist and perfectly spiced. The frosting, while not my cup of tea since it’s cream cheese based (I’m a traditionalist requiring sweet buttercream, piled high. I can’t help it. ), it tastes good. 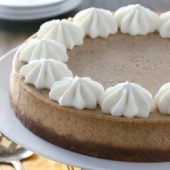 This cream cheese frosting is smooth and luscious while ever so slightly flavored with pure maple syrup. Don’t skimp and use pancake syrup, use the real stuff. You can even buy a mini bottle if you don’t plan on using it much. Since Easter is nearly a week away, you should absolutely save this to make for your family and friends. Or for any Spring party, because it’s officially Spring and we should be celebrating! I made this a more manageable recipe, yielding 6 cupcakes. Who wants a dozen cupcakes sitting on the counter taunting them if you don’t have people over to help you eat them? But if you’re having company, simply double the ingredients to make 12 cupcakes. BTW have you noticed how late it’s still light out already?! So exciting. Easy and moist homemade carrot cake cupcakes topped off with smooth cream cheese frosting, lightly flavored with pure maple syrup. Preheat oven to 350 degrees. Line 6 cavities of a muffin tin. Finely shred carrots, set aside. In a large bowl, mix together applesauce and vegetable oil, followed by egg and vanilla. Mix in carrots. Mixture will be sloppy. 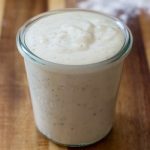 Add remaining dry ingredients and mix until batter is smooth. Using a large cookie scoop, divide batter among prepared liners. 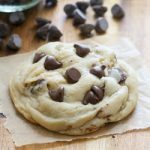 Bake for 20-22 minutes or until a cake tester inserted comes out clean. Cool in pan for 3-5 minutes before transferring to a wire rack to cool completely. Meanwhile, prepare frosting. In a large bowl, beat together cream cheese and butter until smooth. Add powdered sugar, mixing until well incorporated. Finally, add enough maple syrup for desired taste and spreading consistency. Frost and decorate cupcakes as desired. Double ingredients for 12 cupcakes. Yes! There should be no carrot shreds in carrot cake. Veggies just don’t belong in cake unless you shred / puree them so that you can’t notice them. But you know, I don’t like veggies at all so this could explain my stance on this topic. Everyone who tries my carrot cake thinks it’s spice cake. And I’m okay with that. I’m the same way! I only like a handful of veggies lol So awful of me. I’d rather fruit. But these are SO good. Hi Rachel! I just found your blog and it’s beautiful. In regards to text on photos, I like it, but I’ve found sometimes it takes away from the photo. However, the way you’ve done it is elegant. Now- I love carrot cake. 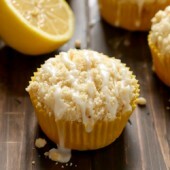 It’s super sweet, moist and you feel like you’re having a healthy treat. So glad you found me! And thanks for the input on the text issue. I think it’ll be a total case by case basis on if I do it or not. These look so good! love this maple frosting. 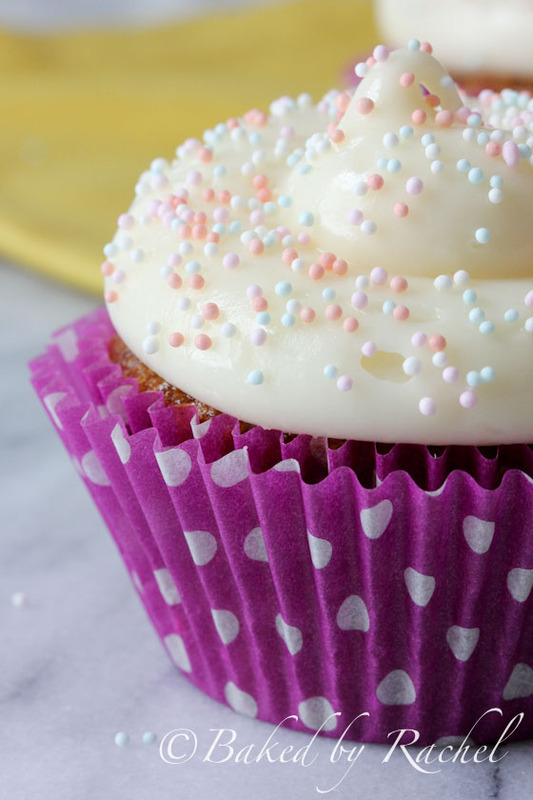 These cupcakes are *almost* too pretty! Love them. I like the text on the first photo! I don’t always, but I like the way you did it there. 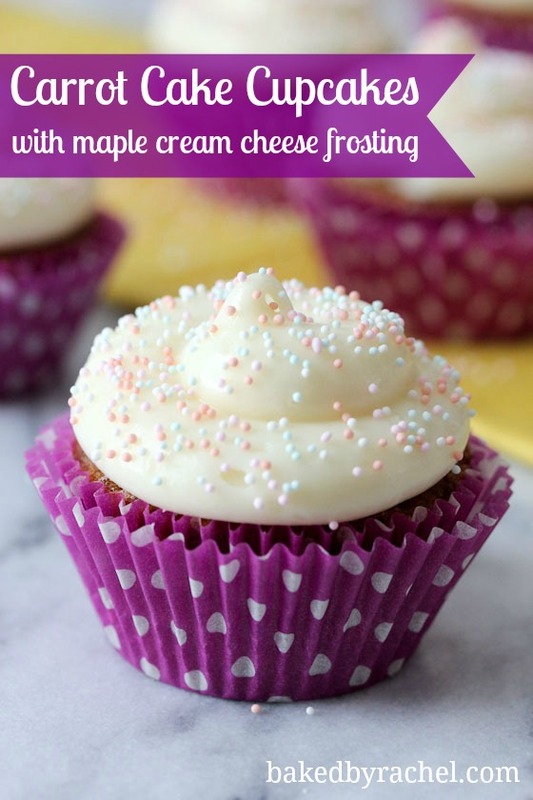 I’m curious if it ends up leading to more pins, keep us posted :) Anyway, I love everything about these – cupcakes plus maple plus cream cheese? I’m there! I’ve never been into the whole zucchini in desserts thing but I do love a good carrot cake recipe! Beautiful cupcakes. I’ve never been a big fan of carrot cake either. And should I use sweetened or unsweetened applesauce? Sorry for all the questions! So sorry for the typo. I guess I was writing a more traditional cupcake recipe in my head. ;) All fixed now. As for the applesauce, use whatever you have on hand. I happened to have cinnamon applesauce, so that’s what I used. I don’t think it’ll make a huge difference either way. I have been craving carrot cake lately and now I want this frosting too. These look incredible! Thanks! That’s why I’m so torn. I usually prefer without most times but I had way too much fun creating that lol. text on photos typically annoys me…I feel like bloggers overuse it and it’s a giant flashing PLEASE PIN ME sign…that being said, i think the way you did it up there looks good!! Rachel they’re gorgeous! I love carrot cake and with that cream cheese frosting, so good! As an aside, what do you use to make your graphics/banners? Picmonkey or something else? I love that purple ribbon effect! Thank you! 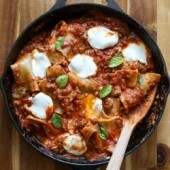 I did this in picmonkey – pretty easy but In Katrina’s Kitchen has tutorial’s if you get lost. I LOVE this post for so many reasons! First…I just love your photos…they are gorgeous, the cupcakes are beautiful and I love the text you added! Looks great! I need to figure out how to do that too. Also, this recipe really sounds yummy! Carrot cake is one of my family’s favorite and I love the idea of really finely shredding the carrot! Lastly…pure maple syrup is heavenly and sounds so good in the frosting. 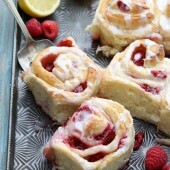 I”m bookmarking and making these for my Easter brunch! Thanks! I feel like a toddler when it comes to using picmonkey but if I can do it, so can you! And thank you for all of the sweet comments! LOVE these! 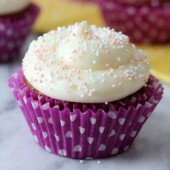 Such cute cupcakes and the frosting sounds amazing with the maple flavor! Rachel, these are adorable! I bet they’re incredibly delicious too. They sure look it! 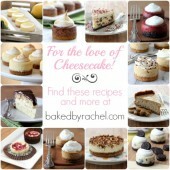 Obviously, as a carrot cake lover, I must try these ASAP! they look amazing! where are the sprinkles from? I’m pretty sure I picked them up at Target last year around this time. Finely shredding the carrots is key in a good carrot cake recipe. I don’t want chunks of vegetables in my cake. 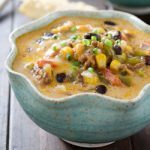 This recipe looks delicious with all the spices and its really not all that unhealthy for you either! Look at you getting all text=y with your photo :) You know my opinion on it- and I think you did an awesome job. For me *personally* text on every photo would be too much but text on one is great. If I want to grab your text pic I will but there are lots of other options too. Also- ummmmmm I want a cupcake. 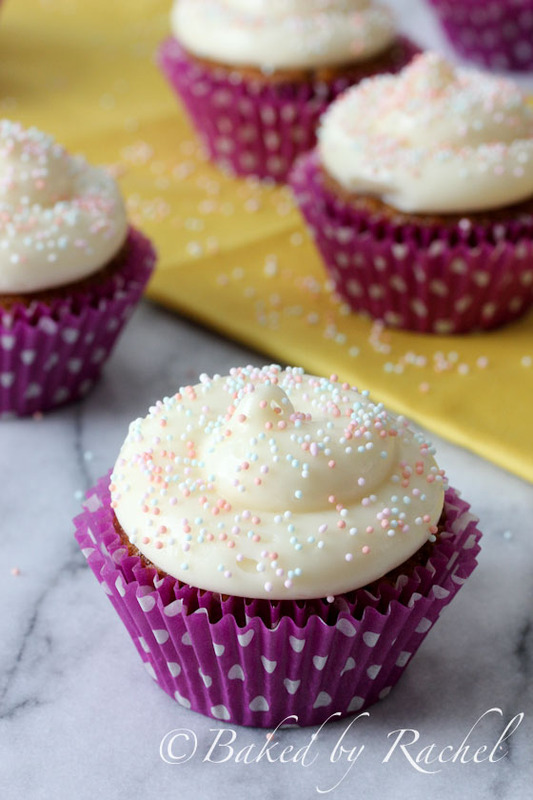 These look perfect with those pretty sprinkles & I love maple cream cheese frosting! I am searching for the perfect carrot cake recipe for my father in laws birthday next week. I think I found the winner. The applesauce is in place of the vegetable oil. If you wish to not use applesauce, I would replace with vegetable oil instead but I cannot be sure that your results will be exactly the same as mine. 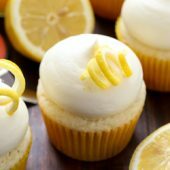 As for the butter, there is only butter in the frosting, not in the cupcake itself. I agree with you thick shards of carrots are distracting, I like a smooth texture to my carrot cake as well. I recently discovered that I love carrot cake. I am excited to try these! I am wondering if the cake part freezes well? 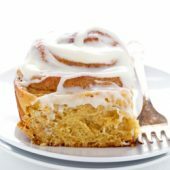 I imagine they’d freeze fairly well without the frosting. Just be sure to wrap them well. I love that you assure us no stringy carrots! I too used to dislike carrot cake for that. Those sound good. I like that it’s written for 6 cupcakes, but I need 18. Can I just triple it? Hope so. About to do it now. Ummm.. Still not clear on the butter question! I haven’t personally made this into mini cupcakes but you shouldn’t have a problem. I believe 1 regular cupcake typically equals 2-3 minis. As for bake time, I would start out by cutting it in half as you mentioned. It’s always best to start there and continue cooking longer as needed. I am not a big carrot cake fan but these were the best cupcakes and frosting ever. My friend and I gobbled them up! I think hubby got one out of the whole batch…So the only complaint I have is the yield should be about four times greater. :) I did make half the amount of icing and there was still plenty.